The destabilization of Mali and southern Algeria is a complex political and social process that does not have only one cause. But a changing ecology forced by climate change is a major contributor to the region’s problems. 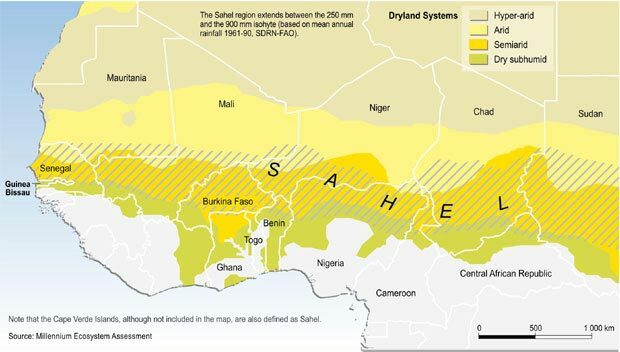 This region is part of a Saharan and sub-Saharan band across Africa called the Sahel. I have traveled a bit in the far west of the Sahel, in rural Senegal. The climate of the Sahel has fluctuated over the decades, being determined by big phenomena such as El Nino and the Indian Ocean monsoon, as well, it has been discovered, as how warm the waters of the Indian Ocean are. In the first 7 decades of the twentieth century, the region got a fair amount of rainfall, and lower Mali where the capital of Bamako is could raise livestock, making Malians agriculturally relatively well off. The consequent rise in population (Mali is now about 15 million) probably made the country overpopulated for what it could sustain in the more arid decades after 1980, when the warming waters of the Indian Ocean produced dry conditions in the Sahel. Global warming has accelerated in the past 40 years, as the billions of metric tons of carbon dioxide factories have spewed into the atmosphere has produced a greenhouse effect, trapping heat in the earth’s atmosphere. It is estimated that global warming could reduce the amount of food produced in Mali by as much as 16% by 2050. The drought of the 1970s caused thousands of northern Mali Tuaregs to go to Libya. Col. Muammar Qaddafi organized them as a mercenary unit. Qaddafi, however, dissolved it in the late 1980s, at which time many Tuareg came back to Mali and participated in the 1990 coup. Ghali was active in the secular Tuareg nationalist movement, National Movement for the Liberation of Azawad (MNLA), in northern Mali in the 1990s. Then in the late 1990s, he came into contact with the Tablighi Jama’at, a Pakistan-based Muslim revivalist organization that specializes in helping secularized Muslims recover their faith. Tablighi Jama’at is politically quietist and not violent, but is relatively fundamentalist with regard to approach to Islam. Ghali became fanatically religious and gradually adopted Wahhabi ideas, becoming devoted to destroying the Sufi shrines so popular in Mali. Ansar Dine, Ghali’s organization, doesn’t seem to me to have grown out of the 2011 Libyan War and return of Tuareg mercenaries from Libya. Ghali came back from Libya in the late 1980s, and his turn to radical Muslim fundamentalism happened in Mali in the late 1990s under Pakistani influence. The return in 2011 of further mercenaries did contribute to the declaration of Azawad independence by the Berbers of the north by the secular nationalist Azawad National Liberation Movement. Its members don’t for the most part agree with Ghali’s harsh Wahhabi ideas. In turn, the loss of territory in the north angered the Mali officer corps and contributed to their decision to make a coup against elected president Amadou Toumani Touré last March. The sanctions slapped on Mali as a result by its neighbors and by NATO members later last year forced the military to at least say that they were abadoning the coup, installing the speaker of parliament, Dioncounda Traoré and a national unity cabinet. This government was in turn overthrown by the officers in December, 2012, so that there has been a second coup.